Dear lillie, you are the best. but you also have the most beautiful home. You are so very talented. And could your little models get any cuter? Screen printed tees to match mom, love it! And you even blogged about me and my little home! Savannah and I are now the proud owners of these lovelies. Everything you get your hands on turns to gorgeous! Where am I going with this you ask? will pick a random winner one week from today! These are absolutely GORGEOUS!!! Love, love, LOVE them! These shirts are sooo pretty. I would love to win one! Those are so cute! I love that crown tee. What an awesome idea! They are soooo cute! I would love to win! What an absolutely GREAT giveaway!!! Love it!! 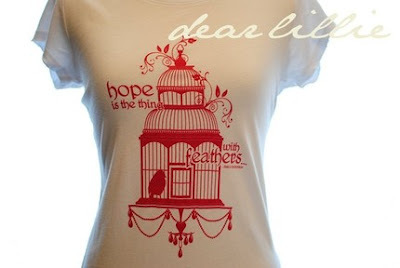 I love all of Dear Lillie's tees. I'd really love to win one. LOVE them! I adore dear lillie's blog as well! I love the shirts and her daughter is just adorable!! These shirts are so beautiful! I'd love to have one. You're right, those models are adorable! Cute shirts too! I would love a t-shirt! These are so unique and beautiful! I love these! Esp. the crown...Camille! Lovely, feminie, girly shirts. How nice! I heart silhouettes too! These are too cute!! gorgeous! adore the crown and bird cages. what a pretty name too! These are way TOO cute!! Would love to win one! Adorable! I have friends with baby girls on the way... I'll definitely be showing this to them. ooooh!! such cute shirts... i hope i'm lucky enough to win!!! I would just love the T. So different and sweet. Love them, so unique. I would love to win one. I would love one of these! Too cute! Thanks for sharing these adorable tees ~ count me in! these t-shirts are absolutely darling. i would love to win one. Please enter me. Oh PLEASE.... me...me....me. I LOVE that silhouette shirt! I always need help in the fashion department! These tops are awesome! I am new to your blog and wish that I'd been following you forever. I have thoroughly enjoyed it. You are incredibly talented and oh, so sweet! 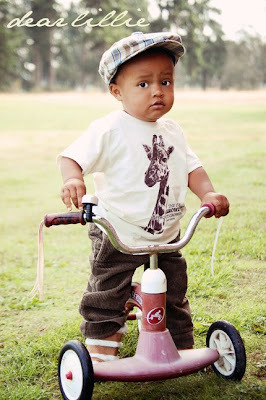 The little guy on the trike is TOO CUTE! Would love to win. Those shirts are so darling...where can I get one..? i big pink puffy heart dear lillie and everything that they do! i just ordered a few items from them and i can't wait to wear them! These is my first time to leave a comment or try to win something in the blog world!! I am trying to get my blog up and running and you have been my inspiration!! Love that the boys are not left out! :) So adorable! I have tee envy. These are all fabulous! Dear Lillie's stuff is great. I especially love the ones with bird cages and crowns. These shirts as so cool! Would love to win one. Love them! I love all things cotton and theses are perfect. love the shirts! so cute! Those shirts are too cute! The shirts are so fun!! Love them all. Love your blog!! Hope I win..
Super Cute! I love, love, love these. My Little E and I would look so sweet in a set! I adore dear lillie! Would love to win! Ooh, thank you for introducing me to handmade pretties that make me squeal with glee. I'll be picking something up even if I'm not chosen - I'm turning the big 30 next week and I think that requires some Dear Lillie. So adorable! I'm in love with the silhouette with the ribbons. These shirts are beautiful! So beautiful and feminine! These are soooooooo cute! Love it! love love love these, so darling!! Love these beautiful shirts. I love the girl silloutte one. Oh my her shirts are adorable and I love her dresses for little girls! LOVE the shirts and her blog!!!! I looovvvee these tops...so cute. I entered a giveaway over at another blog and didnt win. It was the little giraffe t for my little guy. I hope to have better luck this time!! :) Love your blog...u are such a lovely talent! Oh my gosh I've never seen these before but I want one badly!!! Gorgeous T's. Love the little girls dress too. Yes, I want one like yesterday! Love your blog Melanie! Gorgeous! I would rock that crown tee with pearls and high heels! Love them all!! So adorable! I heart them all but especially the silhouette one!!! Those shirts are so adorable! I am in love with the silhouette shirt. So stinkin' cute! Melaine, Thanks for the introduction to such a beautiful product. So feminine. How cute! I need (OK want) one. Found you on RMS and fell in love with your home! So happy to find your blog, you inspire me to do so much more to my home!! i think my little man would look adorable in one of these! they are fabulous! I love those shirts and those models are adorable! The little boy on the bike is so cute. What a doll! What a fun giveaway. Such fabulous clothes, I love them! where can I get these?! Amazing! The shirts are really cute, but you are right, the little models are way beyond cute, they're adorable! I adore Dear Lillie! Her blog is just beautiful! I would love to have the Jane Austen or Mary Poppins shirt! Great giveaway! I love Dear Lillie :) I really want the Fairyland tee! I would love one of these beautiful shirts and I love reading your blog too! Thanks so much for posting this, Melaine!! I always loved her home on Rate My Space a couple years ago and didn't know what happened to her! How fabulous! I love them, they are totally gorgeous! Love the Anya Vintage Dolman sleeve top and the vintage crown tee in granite! These are the cutest tee's ever. Love them all!!! I would love to win one. So beautiful! I went to their site and just love the pictures! Too bad I don't have a little girl anymore. Oh goodness, I l.o.v.e her goods! So creative and beautiful! Your black tank is FUN! Would love to be entered to win a t from her collection! Awesome!.......i didn't know about dear lillie and i'm so glad to be introduced. :) very fun and different. that little silouette dress is adorable!!!! I just recently discovered their shop & LOVE them! I was headed for their blog & stopped by yours first...how funny! Love the tees and my 7-yr.-old is so into matching mom right now! How lovely! I have a framed print with the Dickinson verse about Hope. It's one of my favorite quotes. I'd love to be entered in your giveaway, please. oh my Melaine! What a wonderful treat to start my day! Lovely!!! These are the cutest shirts! I love them! Fabulous...I love the silhouette t-shirt!!! Yes please! 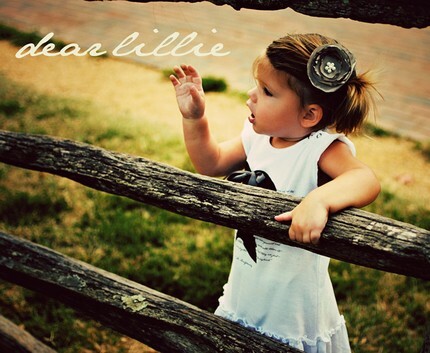 I love Dear Lillie sooo much, I want to win! Soooo cute!!! Love the crown and bird cage...oh, who am I kidding....I love them ALL!!!! Love all of them! Gorgeous! I LOVE Dear Lillie! Adorable!! Love these....so original would love to win one! 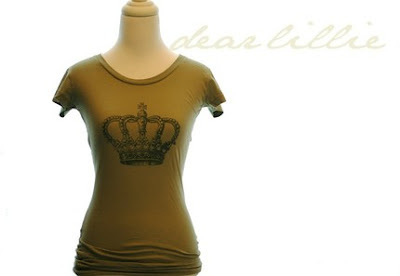 Dear Lillie tees are simply gorgeous. Oh my gosh - the t-shirts and her models are ADORABLE!!! 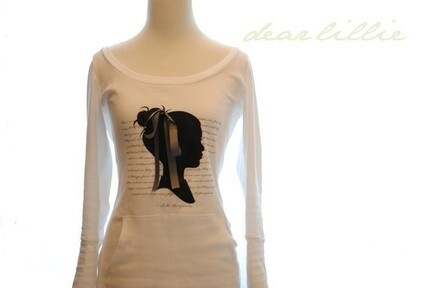 I would LOVE one of these Dear Lillie tees! They are all too cute! !I have to have one. These are super cute and now I'm going to check out her house! Oh so pretty! Thanks for the chance to win! I LOVE dear lillie stuff!! I would loooove tee shirt of my own as well~pick me pick me!! This tees are faBulous! Thanks as always for passing along great finds! oh so lovely! fab & glam for everyone! These t's are so fun & creative! What darling shirts! Count me in Please!! These shirts are very cool. would love to have one. These are gorgeous, I would love to have one. Pretty shirts! Fun giveaway :)I am liking the silhouette. 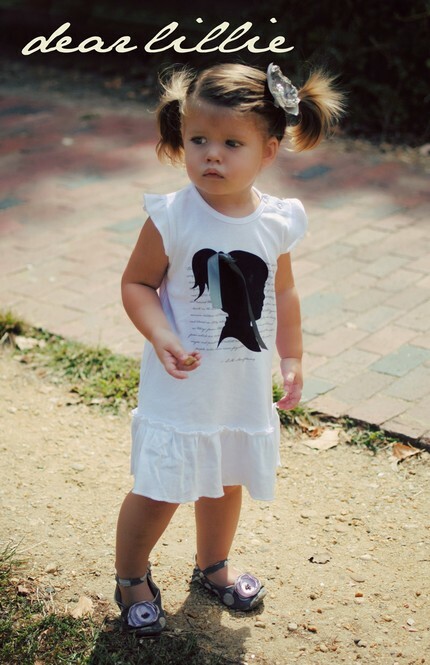 I think the tees you and Savannah will wear are darling! Love love love the silhouette tees! Thanks for the great giveaway! OMG - Love, love, love! Please pick me! These are absolutely wonderful!! Love them, and your awesome Blog! You have such wonderful ideas!!!! Many blessings to you and yours!! love your blog.... craving the t-shirt! UBER cuteness!! :D LOVE the last picture...the kids are all so adorable in their cuteness shirts! These are ADORABLE!!!!! Love the crown one!!! !